... is what we've been about from day one. And since that day, we've been living up to our performance promise of making great tone accessible to discerning players. Designed with sophisticated simplicity in mind, our tone-sculpting tools are conduits for inspiration. Plug in, put on unforgettable performances, and relish those magic moments in a guitarist's life. But great tone is not alchemy or weird science. It's a capability built on passion and know-how. Even after all the years marked by so many milestone achievements, that passion burns as brightly as ever. 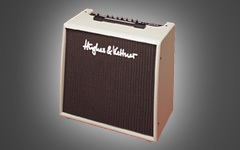 When Mr. Hughes and Herr Kettner first met, Mr. Hughes was on a tone quest, looking to enrich players' sonic palette with more soulful means of expression... A glockenspiel's chime, the snap and snarl of a junkyard dog, the seductive wail of Siren's song, the thunderous rush of a passing freight train, the howling of a keening jackal, the malevolent grind of a chainsaw biting into metal - could an amp really be made to do all this? Engineering whiz Herr Kettner had his eyes on a very different prize. Envisaging a compact amp that would deliver fully-formed sounds including effects at the touch of a button, he sought to do what has never been done before. And he wasn't averse to doing better what has already been done. So began an impassioned collaboration that continues to this day. ...and the world's first fully programmable guitar amp. 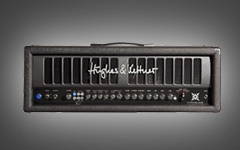 It soon went from raising eyebrows to making the Hughes & Kettner brand known around the globe. Amp designers got a lot of mileage out of the successful concept behind the Cream Machine over the years. 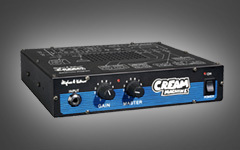 Amp designers got a lot of mileage out of the successful concept behind the Cream Machine over the years. 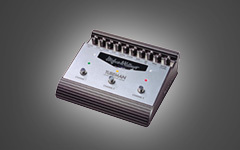 It featured prominently in the Crunch Master (USA: Blues Master), Metal Master (USA: Metal Shredder) and Bass Master (USA: BATT). 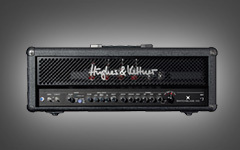 Professional guitarists, keyboardists and bassists were quick to embrace these amps. Today mint specimens are highly sought-after classics. The ATS series was the world's first pairing of tube preamps with solid-state power amps to be produced on a mass scale, thus foreshadowing the megatrend to come, hybrid amps. 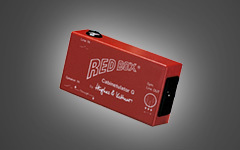 The inceptive RED BOX was the first guitar cabinet emulator on the globe. The inceptive RED BOX was the first guitar cabinet emulator on the globe. A resounding success from the moment it hit stores, the name RED BOX soon became the generic term worldwide for this new category of product. It's so pervasive in the USA that it's used as a verb as in "I red-boxed my amp." 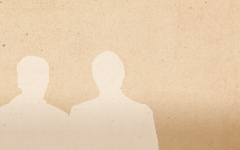 The RED BOX has been constantly evolving, with the fifth generation arriving in 2013. 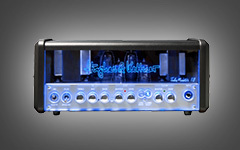 The first Hughes & Kettner offering for bassists, the Fortress came with an innovative preamp featuring a tube-driven input stage and an unprecedented voicing section. Giants of bass like Jack Bruce were Fortress fans. 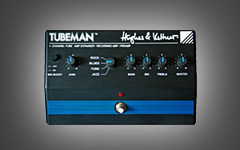 Delivering fat tube-driven tone in a handy, portable format, the Tubeman plugs into the front end of amps and serves up sweet sound direct-to-desk. To this day, it's many studios' tone-tool of choice for all kinds of instruments. 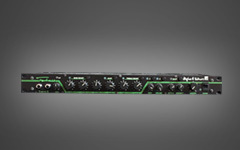 The mother of all fully programmable, rack-mount tube preamps, the Access' three channels, 128 memory slots and integrated MIDI looper also made it the big daddy of every rack. Its counterpart, the VS250 stereo power amp, sported eight EL84 power tubes. The 19" version of the MK1 Tubeman was a welcome addition to racks. The 19" version of the MK1 Tubeman was a welcome addition to racks integrated MIDI looper also made it the big daddy of every rack. 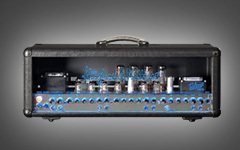 Its counterpart, the VS250 stereo power amp, sported eight EL84 power tubes. Armed with 1.000 watts RMS output power, a dual-channel tube-driven preamp, the ingenious Varimetric EQ and other pioneering features such as a notch filter, the BassBase 600 raised the bar for what a bass amp can be and do. 13 tubes and 6 channels in three independent amp structures: The TriAmp was the first to offer all the legendary amp sounds in a single tube-driven without sacrificing an iota of tone. Switching from one channel to the next automatically reshapes the power amp’s feedback to match the selected preamp, creating three truly independent amps with very different voicings. 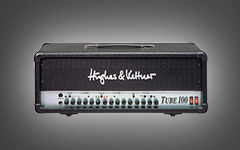 The TUBE series was the earliest of Hughes & Kettner's premium-class, all-tube amp lines. 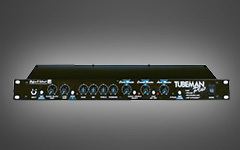 And the TUBE 100 was the first to offer separately adjustable power tube saturation and volume output. 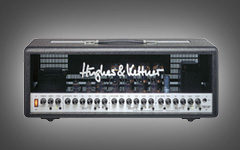 The TUBE series was the earliest of Hughes & Kettner's premium-class, all-tube amp lines. And the TUBE 100 was the first to offer separately adjustable power tube saturation and volume output. Amp sounds in a single tube-driven without sacrificing an iota of tone. Switching from one channel to the next automatically reshapes the power amp’s feedback to match the selected preamp, creating three truly independent amps with very different voicings. 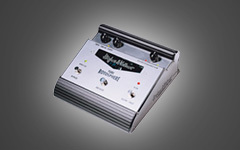 Offering the musical qualities of a classic tube-powered rotary cabinet shoehorned into a foot pedal, the Rotosphere still figures prominently in many a legendary axe-slinger's live and studio rigs. Offering the musical qualities of a classic tube-powered rotary cabinet shoehorned into a foot pedal, the Rotosphere still figures prominently in many a legendary axe-slinger's live and studio rigs. 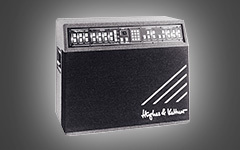 The TUBE series was the earliest of Hughes & Kettner's premium-class, all-tube amp lines. And the TUBE 100 was the first to offer separately adjustable power tube saturation and volume output. The Edition series' extraordinary tone made a big splash when it debuted 1997. The Edition series' extraordinary tone made a big splash when it debuted 1997. The Edition One, Surf Edition, Edition Blonde and Silver Edition would go on to become one of the world's most successful line of solid-state guitar combos. 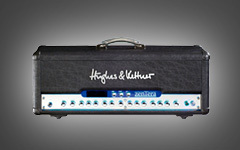 The second version of the Hughes & Kettner classic came in the popular TubeTools format. "Wow and flutter at its best!" 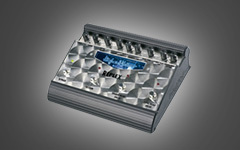 Packing the tonal personality of a classic tape delay unit into the pedal format, the Replex remains popular with many professionals to this day. Called "The boss of modeling amps" by Guitar Player Magazine, the zenTera impressively demonstrated what remarkable tones and features can be achieved with digital technology. With its stunning visuals, the TriAmp MK II raised the bar for design several notches. With its stunning visuals, the TriAmp MK II raised the bar for design several notches. Since the TriAmp MK II first graced a stage, its trademark blue glow has become a beacon signaling great tone and outstanding performance. This was the world's first fully programmable analog tube amp. 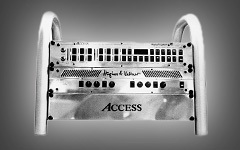 This was the world's first fully programmable analog tube amp.</br>In 2006, the evolutionary advance set into motion by the AS64 22 years earlier culminated in the Switchblade. Its recipe for success was to replace the potentiometers found on conventional amps with Programmable Resistor Networks. Each of these rotary controls consists of 256 individual resistors and 256 switches, and a memory with the ability to recall every switch’s position. 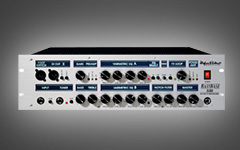 The amp saves every knob’s setting and can recall it at the touch of a button. 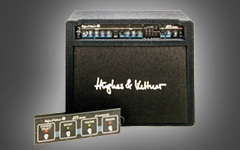 Only Hughes & Kettner has mastered the science of conjuring 128 sounds out of a tube amp without having to turn a knob! The Coreblade is widely hailed as the world’s most advanced professional tube amplifier for the touring artist. It's as programmable as the Switchblade; what's more, it saves sounds straight from the amp to USB stick so artists can travel with no more than an axe and a stick. Coreblade owners can even swap sounds in a flash. And courtesy of TSC (Tube Safety Control), it's peerless when it comes to reliability. Who would have thought tube management could be a blessing rather than a burden for busy gigging guitarists and their technicians? 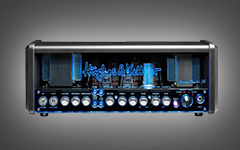 With peace of mind built in, a maintenance-free tube power amp is certainly a valuable asset on the road. But the confidence that comes with knowing the amp will shine with stellar tone at every venue is priceless. That’s progress in the spirit of rock 'n' roll. 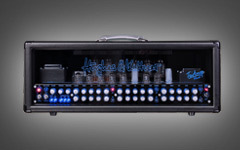 In these amps went Mr. Hughes and Herr Kettner's consummate craft and over a quarter of a century's passion for tube tone; out came TubeMeister, a remarkably compact and beautifully designed instrument. With the benefit of German engineering, TubeMeister can go from clean to mean and from a roar to a whisper, shaking planks on stage, tingling spines in the studio, and raising goose-bumps in the still of night. The built-in power soak brings the sound of the big stage into players' own four walls, and the integrated Red Box lets them lay down professional-quality tracks direct to desk any time day or night. GrandMeister offers all the features that made the TubeMeister series so successful, plus our proprietary Programmable Resistor Network pots introduced in 2006 with the Switchblade. TriAmp Mark 3 is the astonishing result of 30 years of passion, knowhow and expertise combined with an absolute freedom of engineering. TriAmp Mark 3 is the astonishing result of 30 years of passion, knowhow and expertise combined with an absolute freedom of engineering. Featuring a range of professional guitar sounds not offered by any other amp anywhere on the planet, TriAmp Mark 3 offers players breathtaking versatility, inspirational tonality, and unparalleled ease and joy of use. It’s a totally new experience for guitarists: each of TriAmp Mark 3’s six independent channels represents a whole era of tone, and each can be routed to three independent tube power amps.  The game changes right now!